To commemorate the 100th anniversary of the Soviet experiment, the New York Times op-ed page has been publishing a regular series on communism. The overall tone of the essays runs toward wistfulness, and the latest contribution, by Bhaskar Sunkara, editor of the left-wing journal Jacobin, presents communism as tanned, rested, and ready. Sunkara sees a new future for Marxism, only this time without the purges, gulag, mass starvation, and other unpleasant features. Like many Marxist apologias, this fails to grapple with the inherent authoritarianism that is embedded in an illiberal thought system. This is why every Marxist government in history has monopolized power. An ideology that describes a large segment of society as an enemy class that must be eliminated is never going to respect political rights for its opponents. The Bolsheviks had plans to brutalize their opponents from the outset. As early as 1917, Lenin wrote, “Only in Communist society, when the resistance of the capitalists has been completely broken … only then ‘the state ceases to exist,’ and ‘it becomes possible to speak of freedom.’” Lenin may have been “well-intentioned” in the most abstract sense of imagining peaceful egalitarian paradise as the final stage of his vision. But he always envisioned the journey to that destination traversing a river of blood. Older leftists often defined themselves by their relation to existing communist states. Some Social Democrats maintained a fierce anti-communism, while others defended some or all aspects of the totalitarian horrors in places like the Soviet Union or China. Jacobin has existed for less than a decade, and Sunkara is young enough that he can confidently assert that his version of Marxism would never descend into the brutality of the 20th-century version. That does not mean, however, that its disposition toward left-wing authoritarianism is entirely theoretical. 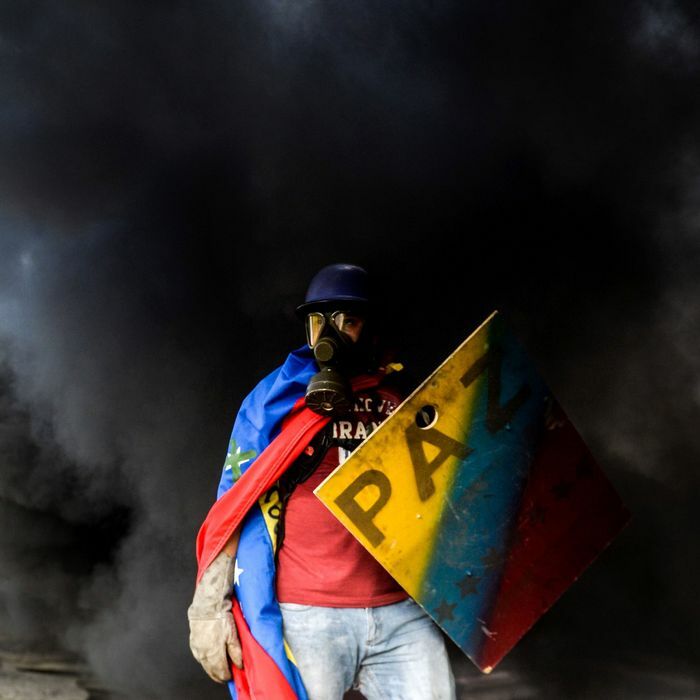 There is one experiment in Marxist, or quasi-Marxist, government recent enough to gauge Jacobin’s tolerance for left-wing repression: the Hugo Chávez regime in Venezuela. The left-wing populist government established by Chávez and his successors may not be as brutal as the regimes of Stalin or Mao, but its ruthlessness is beyond serious dispute. “Under the leadership of President Hugo Chávez and now President Nicolás Maduro, the accumulation of power in the executive branch and erosion of human rights guarantees have enabled the government to intimidate, persecute, and even criminally prosecute its critics,” says Human Rights Watch. “Human rights defenders and journalists frequently faced campaigns to discredit them, as well as attacks and intimidation. Political opponents and critics of the government continued to face imprisonment,” notes Amnesty International. A 2015 State Department report cites, among other human-rights violations, “abuse of political prisoners; interference with privacy rights; lack of government respect for freedom of assembly; lack of protection for Colombian migrants; corruption at all levels of government; threats against domestic NGOs.” Maduro has “neutralized the opposition-dominated National Assembly elected in December 2015 and decimated the judiciary’s independence,” reports the Carnegie Endowment for International Peace. Readers of Jacobin have gotten a very different sense of things. The magazine’s coverage of Venezuela, at least as far as I was able to find online, dates back to the immediate aftermath of Chávez’s death. Even by that relatively late date, when the authoritarian nature of the regime was already clear, Jacobin was defending it against its perfidious neoliberal critics. The tone of the nearly two dozen Jacobin stories on Venezuela I was able to find ranges from celebratory to defensive. “Today we mourn the death of Chávez, tomorrow we return to the grind for socialism,” concludes one 2013 piece. Much of Jacobin’s early “criticism” of the regime laments that Chavism has not gone far enough. The Jacobin line in 2014 was that, “Only a deepening of the Bolivarian Revolution can save it.” Or, “What is needed today, and what is more urgent than ever, is not dialogue or reconciliation, not harmony and understanding, but a radical commitment to press decisively forward.” Indeed, the counterrevolutionary dissidents needed to be crushed: “To the extent that the Bolivarian Revolution has problems, the solution to them won’t come from chats with those looking to overthrow it, but rather the organization of workers trying to fulfill its potential. There can be no neutral ground between those two positions.” The “so-called human-rights abuses” were merely a pretext for Yankee imperialism. This is all the same rhetoric Marxists used to justify the bloodshed in Soviet Russia and Maoist China. The revolution is not a dinner party, etc., etc. 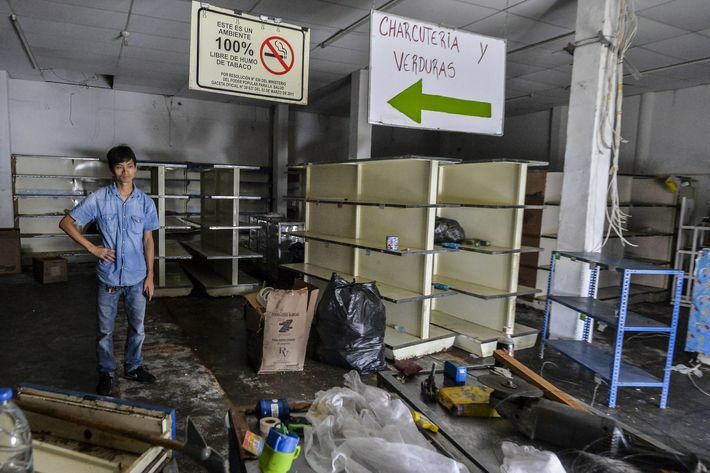 As the Venezuelan economy has tumbled into crisis and the regime’s failure has grown harder to deny, Jacobin’s coverage has softened, but only incrementally. Demands for more fervent adherence to Marxist dogma have given way to criticisms of the regime’s critics. If you have read the mainstream conservative analysis of Donald Trump, which focuses heavily on pushing back against the media and his opponents, the tone will be familiar. “In mainstream accounts of last week’s protests in Caracas, the opposition is depicted as an essentially peaceful force,” complains one story. “Strangely missing from the narrative of the Venezuelan opposition’s peaceful march to victory over a cruel dictatorship was the small detail of the murder of a Venezuelan police officer by demonstrators Wednesday evening,” insists another article, assailing a double standard: “In most cases, ‘blue lives’ apparently matter an awful lot — except when they’re serving under a self-declared socialist national government that has been branded an ‘unusual and extraordinary threat’ by the United States.” A procession of stories has dismissed reports of failure in the country. “Western journalists” are wrong, FiveThirtyEight is wrong, even Bernie Sanders is wrong. Sunkara may want to work out why Marxist principles failed in the past, but he seems determined not to arrive at any conclusion that implicates the ideological principles that caused those failures. In his Times op-ed, Sunkara suggests, “The threat to democracy today is coming from the right, not the left.” That is correct, but only because in the United States today, Marxism represents a minuscule faction with no plausible opportunity to obtain national-scale power. Those on the left who care about safeguarding democracy should work to keep it that way.